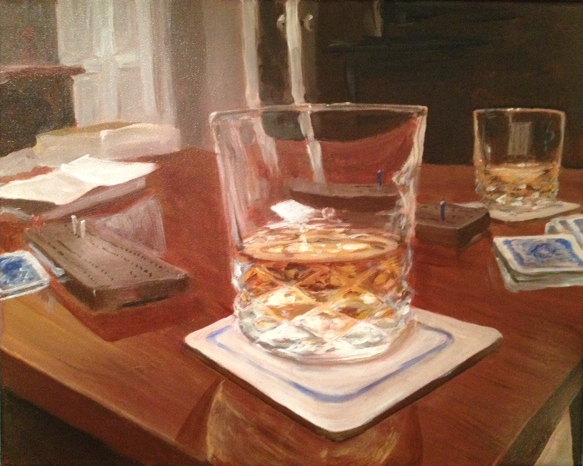 “Scotch and Cribbage” is complete, and as the annual SXSW Festival gets underway (for me the marker of the end of “winter” here), I know I will be summoning this cozy, cold night many times as the mercury rises for the next 6 months. It is the biggest canvas I’ve worked on to date, and I’m really enjoying the space. I hope you do, too! I just love the “girlfriend-in-law” coinage! I cannot offer an Icelandic equivalent, but there’s a close one, which amused me for its specificity: a “svilkona” is one’s husband’s brother’s wife. And btw, you are the best girlfriend-in-law I could wish for, too! Oh, and I forgot to mention that I love the idea of you expanding to gigantic canvases. Especially when they are colorful. I love a language that values specificity, and what a great word regardless. I look forward to enjoying the best girlfriend-in-law visits soon in Austin/Iceland/Wherever and thank you for all your encouragement and support! 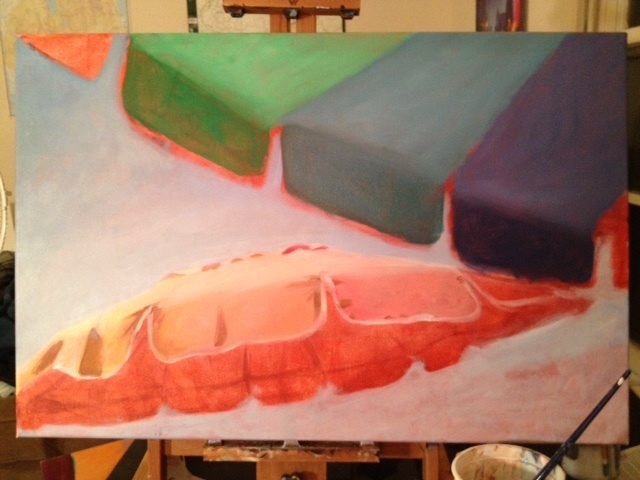 This is a wonderful painting in progress, Red. Can’t wait to see finished product. Your colors are so fresh and spirited. Thank you, thank you! To be finished very soon! Excellent. You have a great future ahead of you.